THE Shearer-Smith family’s Smithfield feedlot near Proston in Queensland’s South Burnett district was announced as Woolworths’ national livestock supplier of the year for 2014, during a glittering dinner for 900 in Sydney late last week. The livestock award, the Pat Dempsey memorial trophy, featured among a list of supply chain partner awards made during the annual dinner at Darling Harbour. 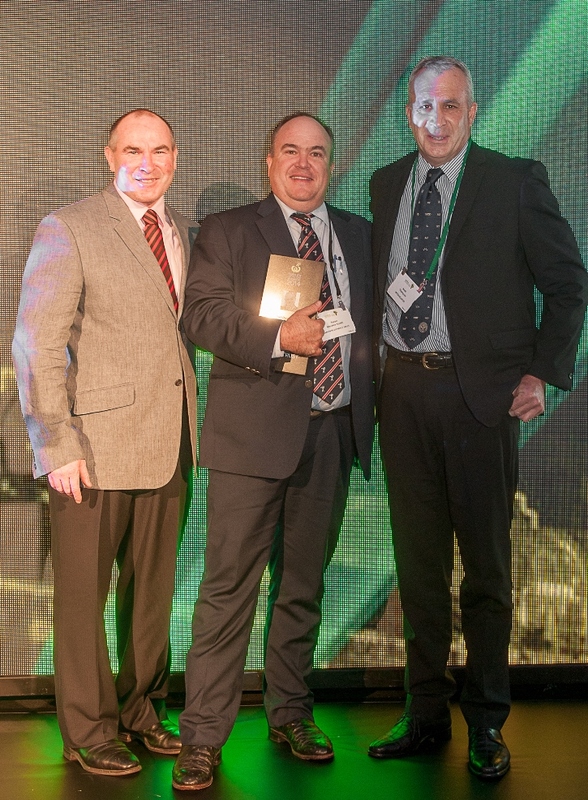 Smithfield Cattle Co’s Jason Shearer-Smith accepts Woolworths Livestock Supplier of the Year award from general manager, supermarkets, Pat McEntee and national beef procurement manager Brett Thompson. Overall Woolworths Food and Grocery Supplier of the Year for 2014 was Beak & Johnson, also well connected with the red meat industry through its large and expanding range of value-added and pre-cooked meat protein-based meal products retailed through Woolworths. Beef Central plans to come back for a broader interview with principal David Beak soon. Smithfield feedlot is one of Woolworths’ northern supply chain’s larger contract suppliers, delivering around 20,000 MSA compliant steers and heifers under its supply contract each year, representing weekly runoff of around 400 head. The win provides clear evidence that even feedlot suppliers at the large end of the scale can provide the attention to detail necessary to win this coveted annual title, which is based on MSA compliance, approach to supply chain management and a host of other criteria. Smithfield has grown with the Woolworths domestic beef program, starting with a contract for just 60 head a week back in 1996, before going through a series of contract increases every few years since. “Today, it’s a huge part of our business, not just in a numbers and throughput sense, but it also provides a level of predictability to our feedlot business,” Smithfield Cattle Co managing director Jason Shearer-Smith said. “While demand for custom feeding can vary considerably from year to year and even within years, having that regular, constant feeding business is very important,” he said. “The program’s forward pricing contract is also important, and you get a reputation for buying good quality cattle,” he said. Smithfield Cattle Co sources the bulk of its feeder cattle for its Woolworths program from Queensland’s Western Downs, looking for British/Euro crosses, perhaps with a splash of Indicus content, not above 25pc. Steers often make up 20-30pc of the turnover, and heifers the balance. Typically, cattle average around 80 days on feed, well above the minimum standard for domestic grainfed, to achieve better MSA compliance. The feedlot looks for ADG performance around 2kg/day, converting at around 4.8 to 5:1 on a dry matter basis. In a process of continuous improvement, one of the biggest changes of recent times has been greater emphasis on backgrounding and pre-conditioning of bought cattle before feedlot entry. 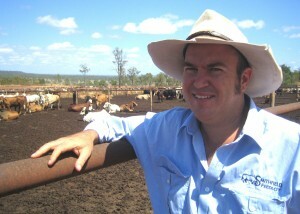 Cattle are paddock-started on a bit of grain, and are drafted into tighter weight ranges. Smithfield regularly runs about 1000 backgrounders on a nearby irrigation property, as part of the process of hitting target weights more consistently. Smithfield today looks for feeders 280-360kg, delivering carcase weights around 270kg after 80 days in the feedlot. “A win like this is great affirmation for our business and our dedicated staff,” Mr Shearer-Smith said. “Our staff work very hard, every day, and do the best they possibly can in delivering Woolworths a premium article. This is recognition of 18 years of hard work to achieve the best outcome every day fort Woolies and other customers,” he said. Smithfield has a reputation as a large custom-feeding service delivery supplier, with approximately half of current cattle on feed under custom programs for outside owners. That’s changed from three or four years ago where perhaps 70 or 80pc of cattle on feed were company owned, with only 20pc custom-fed. Woolworths national procurement manager for beef, Brett Thompson, said the result was a great credit to Smithfield feedlot and its team. “People have been able to grow with Woolworths as our requirements have expanded, and that’s really important. Many have been with us 15 or 20 years or more. It’s about communication, guaranteed supply, and a can-do attitude,” he said. This year’s other livestock Supplier of the Year finalists were Bob and Michelle Jamieson, Rivendell, Inverell, and Darren and Lisa Frankel, Frampton Flat feedlot, Tullibigeal, near West Wylong NSW. 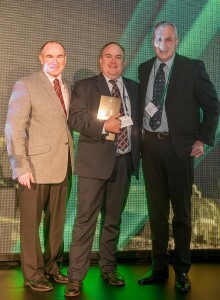 The livestock supplier of the year award for the first time this year was made in commemoration of the late Pat Dempsey, who worked in senior management roles within Woolworths for 25 years. He is credited with paving the way for Woolworths’ current beef supply chain model, and the early industry push and ultimate Woolworths adoption of full MSA uptake three years ago. The fingerprints that Pat put on supply chain relationships 20 or more years ago are still firmly planted in the current supply system, general manager of supermarkets Pat McEntee said. “Pat gave us our first contact 18 years ago, a decision for which we remain very grateful,” Jason Shearer-Smith said. “We’ve delivered around 225,000 cattle since, so it has been a very important part of the growth and success of our business,” he said. Congratulations Jason, remember our discussion yesteryear re Woolworths. Good to see fruition. Well done, Jason. Its always good to win something that represents all the hard work done over the year.